VEGF - Vascular Endothelial Growth Factor is a substance naturally liberated by the cells of the body. It is important for growth of normal blood vessels, during wound healing, and to form new vessels to restore the oxygen supply, in areas where the blood supply or oxygen supply is less. 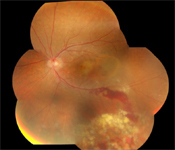 In many retinal diseases such as Wet Age Related Macular Degeneration (ARMD), Diabetic Retinopathy, Retinopathy of Prematurity and Retinal Vein Occlusions, liberation of VEGF results in growth of new blood vessels and causes these vessels to leak, resulting in accumulation of fluid (swelling) and haemorrhage (blood) in the eye. What effects does it have on the retina? In wet ARMD, liberation of VEGF causes growth of new blood vessels behind the retina, in subretinal space. These new vessels can leak fluid or cause bleeding at the macula, resulting in the symptoms of reduced or distorted vision in Neovascular ARMD. This accounts for 80-90 % of severe vision loss in Wet ARMD. In diabetic retinopathy, the basic disease process results in blockages of the small vessels, reducing the blood supply to areas of the retina. This causes liberation of VEGF, which stimulates new vessels to grow on the surface of the retina. These new vessels can bleed, resulting in vitreous hemorrhage, or cause proliferation of fibrovascular tissue and lead to tractional retinal detachments. Leakage of fluid from these vessels at the macula can result in diabetic macular edema (swelling). In retinal vein occlusions too, liberation of VEGF from ischemic retina results in retinal neovascularisation and macular edema. What are the different anti VEGF drugs and how do they act? Ranibizumab (Lucentis) - It is an antibody binding fragment, which binds and neutralizes all active forms of the VEGF molecule. It has been approved by the FDA for treatment of Neovascular ARMD. It needs to be given as monthly injections. Bevacizumab (Avastin) - It is an antibody to VEGF which binds to and neutralize all the active forms of the VEGF molecule. It has been approved for use in metastatic colorectal cancer, and is not yet FDA approved for use in the eye. However, clinical results have shown it to be as efficacious as Lucentis. It may be given as 4 to 6 weekly injections. What are the uses of these drugs? Anti VEGF drugs were initially used for the leakage associated with Neovascular AMD. 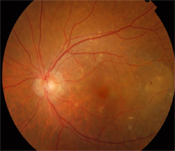 Now the uses have been expanded to include diabetic macular edema, macular edema associated with retinal vein occlusions, vitreous hemorrhage, retinopathy of prematurity, and Choroidal neovascularisation due to other causes such as high myopia, choroiditis, angiod streaks or idiopathic. How effective are these injections? In Wet ARMD, the new vessel formation is the result of aging changes in the retina. The anti VEGF injections do not cure the aging process, but they help control the leakage and bleeding from the new vessels, hence reducing the swelling in retina and the symptoms of distorted vision. In Vein occlusions, the main disease is due to occurrence of thrombus (clot) in the retinal vein. The injection does not remove the clot, but it helps to reduce the macular edema (swelling) occurring due to the blockage by the clot, and thus improves vision. In diabetic retinopathy, the injections do not cure the diabetes, nor do they prevent the retina from getting affected, if the diabetes is uncontrolled. The injections however help to reduce the macular edema (swelling) that occurs due to leakage from the new vessels. Hence it is absolutely necessary to keep the main disease under control (such as control of diabetes) even if the patient is receiving anti VEGF injections, as these do not cure the diabetes. Also, as the effect of the injections is short lived, it may be necessary to give repeated injections at 4-6 weeks interval, to have a more long lasting effect. Can anti VEGF injections be used along with other treatment modalities? Anti VEGF injections are often used as combination treatment, to reduce the new vessels on retina before doing surgery (vitrectomy). This helps to reduce the bleeding during surgery. It can also be used in combination with laser or PDT for Wet ARMD. The anti VEGF drugs have a short lived effect, and need to be repeated at monthly or 6 weekly intervals. The potential complications include those from giving an intravitreal injection, such as infection or increased eye pressure. They also carry a risk of stroke in the elderly, especially if they have had a recent stroke, though this has not been proved conclusively. What are the newer anti VEGF drugs? VEGF Trap Eye (aflibercept) is the newest anti VEGF drug, which is currently under research. It binds VEGF more effectively, and also binds more varieties of VEGF, thus it may have a longer duration of action than currently available treatments. Clinical trials have shown it to be non inferior to Ranibizumab (Lucentis). However currently it is not yet available for clinical use, the FDA is considering it for treatment of Neovascular AMD. A 55 year old male, presented with a painless drop in vision in the right eye since 1 day. Visual acuity (vision) in right eye was 6/24, N36 and in left eye was normal. Fundus evaluation revealed right eye Central Retinal Vein Occlusion. He was treated with intra vitreal Lucentis injections. He received 3 injections at intervals of about 6 weeks. At the final follow up visit, the BCVA in RE was 6/9, N6, and there was no macular edema.